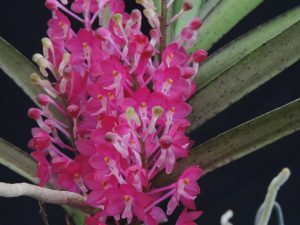 This small growing Vanda species is a real crowd pleaser and our largest plant has six flower spikes this year which gives a really impressive display of bright pink flowers. The species (which is also known as Ascocentrum ampulaceum) is one of the most dramatic species we have seen flowering during our expeditions to Sikkim and seeing it in flower in the greenhouse transports me back to the those wonderful trips. Note the lack of moss on the tree trunk showing the dry conditions experienced at low altitude in the dry season. 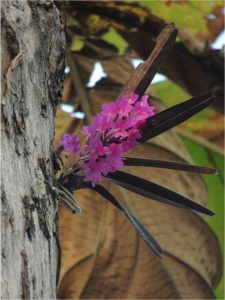 We grow this species in a basket in open bark compost and keep it in Warm Asia (min 20C) for most of the year apart from a short completely dry rest in the roof of Cool Asia (minimum 10C) during February. 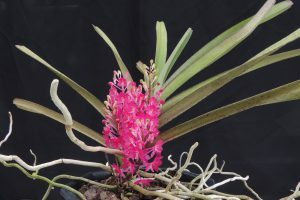 Moving the plant back to warm conditions initiates flowering. I am really pleased to see that our plant has the same dark spotting on the tough leaves as this plant in Sikkim suggesting we have the conditions in Writhlington about perfect.